What began as a one-day tournament with only a handful of fishermen has expanded into a two-day event with close to 100 participants. But throughout the years, the mission remains the same: to celebrate the joy of fishing, the spirit of sportsmanship, and the preservation of the Ausable River. “The mission in the beginning was to bring commerce to the community and to bring people together at an event that they would want to come back to each year, and create memories,” said local fly fisherman and guide Tom Conway. He also owns the Ausable River Two Fly Shop. He and his wife co-founded the event back in 2000. 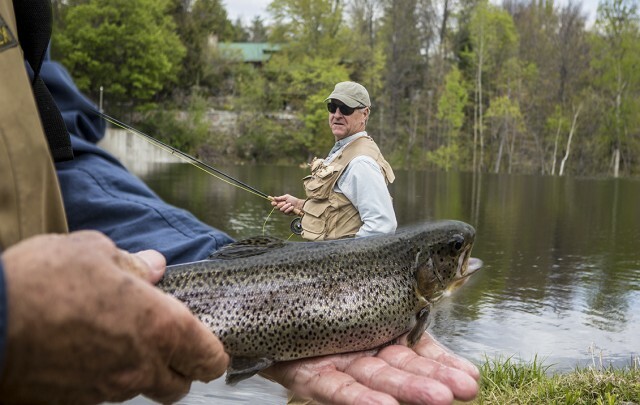 Organizers are now preparing for the 18th installment of the Ausable Two-Fly Challenge, which will be held Friday and Saturday, May 19 and 20, on roughly 10 miles of the Ausable River’s west branch. Participants can fish anywhere from the bridge at the ski jumps on state Route 73 in Lake Placid all the way to the bridge in the heart of Wilmington on state Route 86. Two sections on this stretch are special catch-and-release zones, but participants must release any fish they catch, no matter the section, during the competition. According to Tom, April can be unpredictable based on the harshness of the winter, but May usually brings early season Mayfly hatches. This is when the fish, namely brook and brown trout, become more active and begin to feed from the surface. All of this hatching and fly activity makes it the perfect time to hold the two-fly challenge. 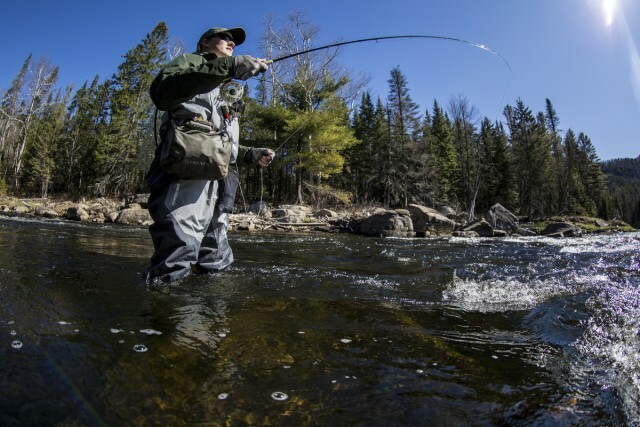 Unique to the Eastern United States, the West Branch of the Ausable River is legendary for abundant hatches of Stoneflies, Caddis, and Mayflies, a culinary delight to the trout who call this river home. A large portion of the West Branch is regulated to "catch and release" only. No fish may be taken from the river. There are four competitive categories: junior, men, women, and professional. Each fisherman can choose just two flies to use per day. ach angler must pick his or her flies prior to the beginning of the day and that’s all they’re allowed to use. If they lose them, they’re done. The choice is a tough one and once chosen, they’re stuck with those flies, even if they find the finicky fish are definitely not interested in a particular fly on that particular day. At the end of the day, each competitor tallies up the total inches of the fish hooked that day and turns in the card. For those unfamiliar with fly fishing, here is a very basic primer: The intent of fly fishing is to fool a fish on any artificial fly that is made with animal pieces (feathers, hair, etc). The fly is cast using a heavier than normal line, which allows the line to gain distance through the air. Typically, a fly fisherman is standing in knee to waist-deep water and casts to a target on the water. Michelle Preston, the manager at the Whiteface Regional Visitors Bureau, is now the lead organizer of the Two-Fly. She explained that the event is not just about fishing, but also camaraderie. Therefore, the weekend also includes a reception, dinner with live music, fly-tying demonstrations, and a casting competition. One of the off-river locations is the region's newest pub, the Pourman's Tap House at Wilmington's four corners. All of the money raised from the entrance fees goes back to preserving the river via the Ausable River Association. If you’re in the area, or want to witness this annual event, make plans to visit the Whiteface Region May 19 and 20. We have comfortable lodging options and delicious places to grab a meal while you're visiting!